I am not changing my stance on a personal level, but based on 7 days and hundreds and hundreds of emails and phone calls. I will do the Web 2.0 thing and let the readers control the content. I have moved Tiger Woods from role model status and over to Sports Star status. Surely you can agree that he is a sports star. I will be re-thinking the vision of the website and am considering listing celebrities on this site that may or may not be role models and letting the public post their opinion on how they feel about each of these stars and maybe even a suggestion as to how they believe they could be a role model. I am leaving the text below and that on the Tiger page live for a few days and will update when time allows. For those of you who have come to this site because of the article posted on CNN or the AP article and have come to express your opinion about Tiger Woods being on this Role Model site, let me offer a brief explanation. This website has been live for about 10 years and some of the content has not been changed in nearly that long including the content about Tiger Woods (as is evidenced by the now updated but recently outdated data concerning his life and career). Yes I have chosen to leave Tiger Woods on this Role Model site and I know from the hundreds of hater emails and phone calls I have received today that my leaving him listed here does not sit well with many of you. I also know that leaving him on this site after his having admitted to having affairs goes against the stated Mission Statement on this very website. I retain the right as the website owner to leave this content on here as a discussion point. Personally I believe what Tiger did was a travesty against his wife and children. I also believe that he has tarnished his reputation in a severe way that is going to take a major act of public humility and time to regain. I pray for he and his family that they survive this as a family. I also believe this is and should be a private matter that he and his family should have a chance to work out in private. I know, I know - he is a public figure and therefore is open for the media beating he is getting but that does not change my opinion or that of several kind-hearted vistors today that have emailed that he should have a time of privacy to work this out. 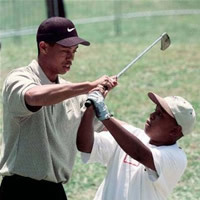 I do not believe Tiger to be a moral role model nor do I think he should ever have been considered one. The same goes for the other celebrities listed on this site. I say that to say that I do not think we should be putting men and woman in such a place that their fall from grace takes us down as well. I do believe there are those who help guide us in the right direction but a sports celebrity is certainly not one of those people. I do believe there are things he has done that earn him the right to receive some positive recognition and will therefore leave him on here for his past philanthropic efforts and for anything he might do in the future that will be a benefit to society and to his family. I am going to give him a chance to prove himself a man by standing up and doing what is right but I am not going to demand or expect him to do it in public. Doing what is right is going to require a humble man asking forgiveness of his wife and family and doing WHATEVER it takes to make that right with them. I did not seek this attention - just happen to be a guy that had Tiger Woods on his website and happened to get media attention. I am not leaving Tiger on this site so he might call me to play a round of golf. That would that be an embarrassing round of golf. Read this article posted in Attribute Magazine about RoleModel.net and the mission of this website. It is the mission of RoleModel.net to promote the idea that there is within each of us the ability to inspire those around us by living a life that is more outward focused than inward focused. By being selfless, we can do our part to make the world a better place, spreading love and hope through our daily actions. It is not only by what we say but more importantly by the life that we live out that shows what each of us is made of.